A note about lavender. If you don’t already have this easy herb in your garden, by all means obtain it. The legendary scent is beloved by humans but loathed by critters. Deer, rabbits and woodchucks are seldom willing to cross lavender’s path in order to reach other, more desirable plants. All varieties of Lavandula angustifolium (including ‘Munstead,’ pictured above) are drought- and heat-tolerant. Although I used cupcakes as a vehicle for my lavender icing, you don’t have to. A plain white cake, or the raised doughnuts I wrote about last week would make fine icing-options, too. Heck, you could even ice your fingers. I’ll never tell. Use whole milk for steeping the blossoms. High-fat milk will draw-out and absorb the lavender essence far better than low-fat milk. *Lacking fresh blossoms, substitute 1/2 teaspoon of dried, organic lavender. 1. 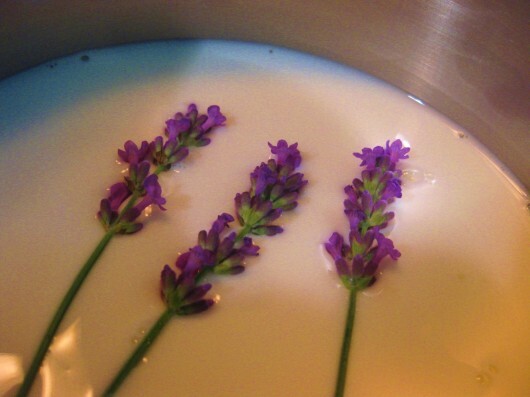 In a small saucepan, bring milk and lavender to a boil; remove from heat, cover, and let steep for 10 minutes. Then remove and discard fresh blossoms, or strain out dried. 2. Pour the scented milk over confectioner’s sugar and whisk until perfectly smooth. If the consistency is too thin for your liking, add more sugar. Add droplets more milk if icing seems too thick. 3. Optional Food Coloring: Stir in 3 drops of blue and one drop of red to l give the icing a violet hue. 4. Pour icing over cupcake tops. The icing on the cupcakes will firm up after an hour or two. Think you’ll try these lavender-scented lovelies? You can let me know by leaving a comment. As always, I enjoy hearing from you. Kevin, they look wonderful. An adult cupcake, for a change! Well, if they taste as good as they look, I'm sold! 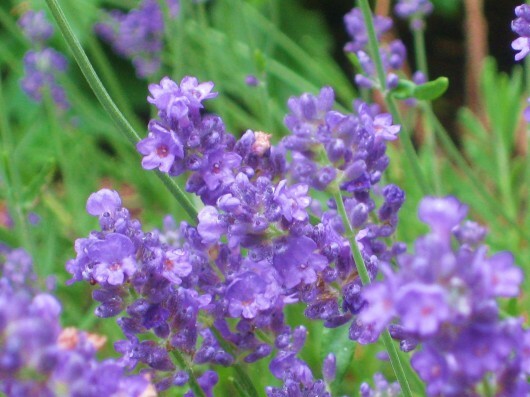 Did you use fresh lavender – or dried? Oh Kevin- these are truly as good (or perhaps better? )than they look. WONDERFUL! The lavender in the icing plays so well with the vanilla in the cake…. (and I left the flower bits on!) Delicious! Thanks so much for sharing!!! You were the bright spot in my day!!! Brenda – Phew! Glad you liked them! Hey, Kevin, are the blossoms of 'Munstead' lavender edible? That's the variety I have. I brought one home to share with the chef son…. he was most impressed! Thanks again!!! Justin – all Lavandula angustifolium is edible. Like you, I grow the 'Munstead' variety; its blossoms were used in the recipe above. Brenda – If your son the Culinary Institute grad and professional chef liked my Lavender-Iced cupcake, then I am doubly honored. Kevin — I am hopping on a train now for those cupcakes!! They look amazing! Judy – They really ARE amazing! Anonymous – Welcome to A Garden for the House. You can buy organic, culinary-grade lavender on line from Daybreak Lavender Farm. And yes, lavender will indeed grow in the desert! It favors hot, dry conditions. I never water my Munstead variety. I want to try these (as soon as the weather dips below 90 degrees!). A colleague of mine made lavender cupcakes before (it was also in the batter) and they were unique and delicious. One of those tastes that you think about long after you have had your last crumb. Thanks for sharing these! Lisa F – great idea to put a little lavender in the batter, too. That is, if you are making the cupcakes from scratch. Alas, I used store-bought cakes. My sister makes a lavender-lemon cake, and leaves the lavender right in the cake (or cupcakes), having soaked it in either milk or warm water with milk substitute (for those with dairy issues, like her). She adds a tiny bit of grated almond paste to the cake batter. Her icing is much like yours, and she always leaves bits of lavender in the icing for the look as well as the flavor. The result is pure heaven! Vicki – Your sister's lemon cake sounds divine! Kevin, I'm glad you re-ran this recipe. This year my lavender 'Munstead' is blooming like mad. Have to make this icing!!! yes – I'd love a taste! Oh I remember these!!! They were such a treat- the lavender gave not only a wonderful scent to the icing (and provide beautiful decoration as well) but was such an unusual flavor! They were delicious!!! If you've never tried cooking with lavender- make this recipe your first!!! Sounds delicious I think I will try a lemon cupcake with lavender frosting. Your frosting sounds great I want to make it today, and have it with my lavender lemonade. Sharon – Lemon cupcake with lavender icing sounds yummy — as does lavender lemonade! I use lavender to make Lavender Jelly. Basil, however, makes the most divine jelly ever. We just made some, with white cupcakes. The icing is yummy, I would perhaps add a bit more lavender next time as the flavor is very delicate. I usually don't make icing, so this was a little runny and messy–definitely calls for many napkins! But tastes delicious! We're bringing a tray of them to bring to a birthday celebration! Thanks for the recipe and the lavender, Kevin! Barb – Mmmm – both jellies sound divine! Lisa F – Glad you tried the lavender icing. If you're used to frosting, you'll find icing very runny. It firms up after it cools. I use only 3 blossoms in the milk, because I've found a too-high concentration of lavender can taste peppery. But that's just me. The icing did firm up, Kevin, and the cupcakes are even better the next day! 🙂 I will try them with some lemon flavor in the cupcakes next time, that was a good suggestion of your readers. Everyone loved them and you are right, after they set for awhile, it was just the right flavor! Thank you! I used to make lavender butter cookies. yum! Also used to place leaves from my rose geranium in sugar for a few days to infuse the flavor. Then simply use the sugar in your recipe. This can be done with a variety of flowers and plant leaves. Great to experiment with! Alice Mae – I use leaves of my rose geranium to scent sugar, too. (Great minds think alike, huh? )The sugar gives everything from cookies to tea a lovely scent. These look delish. I recently tried a lavender cupcake with butter cream frosting. It was a very delicate flavor without being too sweet. I bet your frosting is just as good. I will definitely try this Kevin, perhaps over a lemon bundt cake. My lavender is just starting to bloom here in Boston so I’ll give it a go. Thanks for the inspiration and beautiful pictures. I have lavender in my yard, but I don’t know what kind. Should I find out before I use it? Also, can I make these and freeze them for my son’s wedding. Thank you so much for all your tips and recipes! Brenda from Cape Cod – How lucky you are to have a lavender farm near you! valaerie – This lavender icing would be awesome on a lemon Bundt cake. Cathy – Ah, perfect to serve at a wedding (and congrats to your son). Yes, you can freeze the iced cupcakes. Just hold off on any lavender-blossom-decorations until just before serving. And from the accounts I’ve read, it seems all lavender is edible. Jed – Spare time, indeed! These cupcakes look so good! I do have a question about lavender though. I have lavendar in my garden but they have spread out very thinly and have very little flowers on them. When they die out the stems are very hard and can not be pulled out I have to cut them down. Any suggestions on how to get them to grow better? Once many years ago, I added lavender to regular store bought vanilla ice cream, and it was heavenly!!! I’ve been planning to try it in shortbread cookies, too. 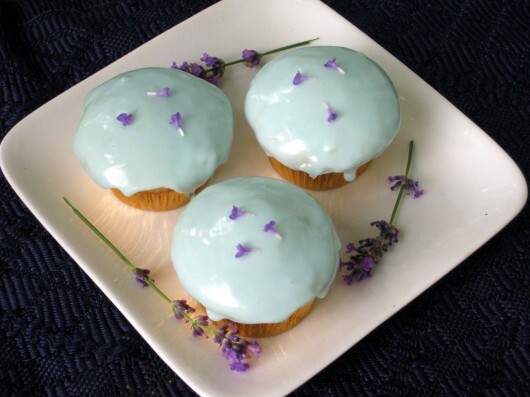 Your icing recipe sounds and looks divine with a tinged lavendar colored hue. The fragrance of course we all know and love, but to actually consume the flower blossoms fills one’s head with a permeating essence I can’t even quite describe…it’s something one my experience to understand it’s delights!!! I’d like that recipe for lavender basal jelly, please! I have also used lavender from my garden to infuse my icings. I dried the flowers and ground them and added a tiny bit of this to the icing. I usually put it on my Lemon cupcakes with fresh lemon curd. And add the lavender to lemon icing. Lemon and lavender are a divine combination. Thanks so much for sharing your knowledge on so many subjects! Just finished with this recipe. Turned out wonderfully. Thank you so much for sharing. Could I grow lavender in a pot on my deck? I live on the second floor and my tomatoes, bell peppers, eggplant and herbs all love my deck. It gets full sun almost the entire day, which made it unbearable most of the summer for sitting out, but a few years ago I thought I bet veggies would love my deck and they do! My dad gave me some seeds to start asparagus in a large pot so we will see how that goes. Just made these today with my “go to” yellow cupcake recipe. However, where the recipe called for milk I added the lavender milk I steeped using unsweetened vanilla almond milk. My 11 yr. old granddaughter & I made these 1 afternoon this past week. We made French Vanilla cupcakes, then she carefully chose the lavender blooms from my garden for the infusion. What a wonderful fragrance! We started the frosting process with white frosting, then Kathryn tinted the frosting pale lavender, then added more food color for a more vivid hue. She artfully decorated the top of each cupcake with lavender blossoms, & then came the best part – when we sampled with a glass of iced tea. Thank you, Kevin! I enjoy your weekly email so much. Deb – Yes, you can absolutely grow lavender on your sunny deck. Sounds like you have quite a container garden there — good for you! VLC – Glad to hear the icing worked out for you even with almond milk. I don’t blame your hubby for “stealing” the cupcakes. Rita L. – What a great activity — and memory — for the two of you! I’d like to try your recipe using dried lavender. Do you have recommendations for the amount of dried lavender to use and if I should steep for less (or more) time? Hi Mira – Use 1/2 tsp dried (food-quality) lavender. Steeping-time should be the same as with fresh lavender. Kat – Nice to meet you. Isn’t lavender the most elegant perfume in the world? Hope to “see” you again! I made the cupcakes and took to a friend’s studio painting party (yes, actually painting art on the studio walls, not painting in a studio :). They were a big hit! I found some lavendar soda in a store. Just 4 ingredients and I thought hmmm, if I can make lavendar icing, maybe I can make this soda myself and it tasted just like the soda from the store. I used dried organic lavendar, 2 teaspoons of sugar in 1/3 cup of water and put it in the microwave for 1 minute and let it sit for 10 minutes just like with the milk. Then I strained the lavendar out, added seltzer water and viola! I had lavendar soda! Lightly sweet and refreshing. Deb – So glad the cupcakes were a hit. And oooh, does that lavender soda sound refreshing! They are very pretty but food mad eout of lavender always tastes like I am drinking my favorite bathwater! Maybe I will have to try again! I too would love to have Barb’s recipe for lavender jelly and Basil jelly. I have lavender growing in my kitchen window. It did NOT bloom in it’s pot last year. What is safe to feed vegetables and herbs to get them to flower? I’m growing lots of leaves on my 1st winter grown tomatoes, getting flowers & tickling them with a little paint brush but have only gotten 2 small tomatoes.